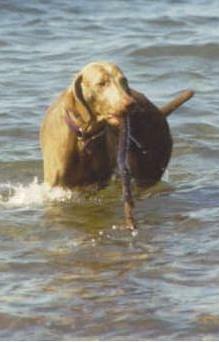 Ruby is our first Weim from show lines and was actually a gift for Junior Showmanship. This sweet girl does anything we ask of her and has been a great companion over the years. Unfortunately for her show career, Ruby hated the show ring. While she has earned her UKC Grand Championship and has accumulated the majority of her required AKC points, we couldn't bear the look on her face to return her to the ring. She would much rather be curled up on the couch or out for a run and we are more than happy to oblige.